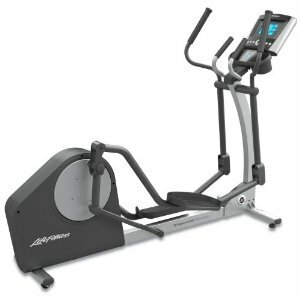 The Life Fitness X1 elliptical trainer is their entry level and most affordable model, but this does not imply that Life Fitness has cut any corners. The experience on an X1 is quiet and the unit weight of 215 lbs, combined with their patented drive system, adds to stability and a smooth ride. It also explains the high maximum user weight of 350 lbs. Separate upper body handlebars provide total body workout. Stride length is 20 inches, making the X1 suitable for even a tall user and footpads are large. Nice touches are a reading rack and dual storage trays for a water bottle and Ipod/MP3 player. Like all Life Fitness elliptical trainers, the X1 gives you 2 options for the console. The basic version gives you 5 different training programs and 12 resistance levels. It displays 7 different readouts, e.g. distance, speed, calories, level, time, heart rate and target heart rate. For an additional $300, the advanced console increases workout programs to 10, includes a Polar heart rate strap, heart rate controlled workout, multiple user ID and race mode. Definitely worth considering when already spending close to a couple of grand.Warranty is solid, lifetime on the frame, 3 years on parts and 1 year on labor. The Life Fitness X1 elliptical trainer is a quality machine and it will provide an experience equal to many more expensive units. The X1 is among the best elliptical trainers available in the under $3000 category.